Adding a sunroom to your home is not a small decision, there are practically thousands of details to consider – ranging from cost to décor. Cossentino and Sons can take the guesswork, and the anxiety, out of the equation when it comes to adding a sunroom to your home. Not only do we have more than 30 years of experience, but our staff is comprised of craftsmen who have worked with us for decades. 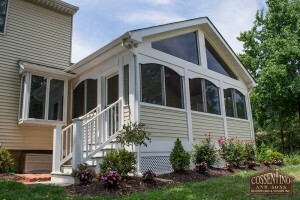 Before your sunroom project begins, our owner Wayne Cossentino will visit with you to determine the scope of the actual project. An experienced contractor, Wayne provides accurate, exact proposals that remove the guesswork and allow everyone to focus on the job at hand. 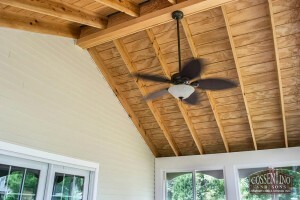 You will also benefit from Wayne’s knowledge of design and construction. He works closely with all of our clients to determine what they want and provides the type of insight and advice that results in sunrooms that reflect what you envisioned before the project began. Once your budget has been established, the design stage begins. You will then work hand-in-hand with our architect who will understand your budget as well as your design and efficiency criteria. From there, we deliver a detailed, accurate Contract Proposal and enter into the construction stage. Cossentino and Sons applies for permits through the necessary government offices, so you have nothing to worry about. We understand that construction can interfere with your schedule and daily routine, which is why we dedicate ourselves to finishing your sunroom on schedule. Our employees treat your home and property as if it were their own, and clean up after themselves at the end of every workday. The sunroom we create for you will provide you and your family with a bright, comfortable room that is perfect for entertaining, relaxing, and enjoying time with family and friends. The exterior of the sunroom will blend in seamlessly with the original structure and design of your home – as will the interior.